Today I attended a class in kiln-formed glass. Wow! One more class tomorrow. Yay! It was held at Vitrum Studios from 10am to 4pm. Not knowing I would take this class a few days back, I signed up for a book signing and reception at the Alliance Française with Belgian writer Amélie Nothomb (Fear and Trembling) which was scheduled at 3pm. After the class, I took a chance and drove to the Alliance just the same. I arrived two hours late and the event was over. The author was having a tête-à-tête with the organizers and about ready to leave, but when she saw me at the door of the salon with my stack of her books, she motioned me to come over and she went back to sit behind a table and signed my books. "Et votre prénom?" she asked politely. When she finished she said, "Merci d'être venue, Thérèse." 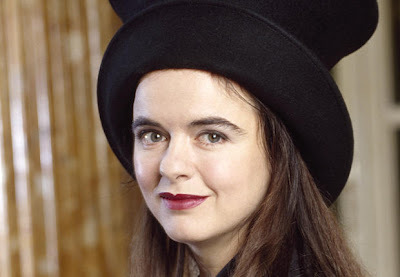 Amélie Nothomb was so sweet. It's almost incongruous with her reputation as an eccentric and her penchant for black ensembles. Yes, today, she was wearing her trademark Mad Hatter's hat and dark red lipstick, just like in this photo.